Celebrate your love for your Mum this mother's day and share a message of love on our bouquet of roses! At Woodlands Hospice, we see on a daily basis how the love and support from family is one of the most, if not THE most important thing when going through difficult times. One of those strongest forms of love is that between a mother and their child. So in anticipation of the day when we celebrate mother's everywhere (Mothering Sunday 31st March 2019), we want to make the month of March all about celebrating the love we have for our Mums!! That's ALL Mums! Those who are with us and those who sadly can't be - let's share our messages of LOVE for them this month. 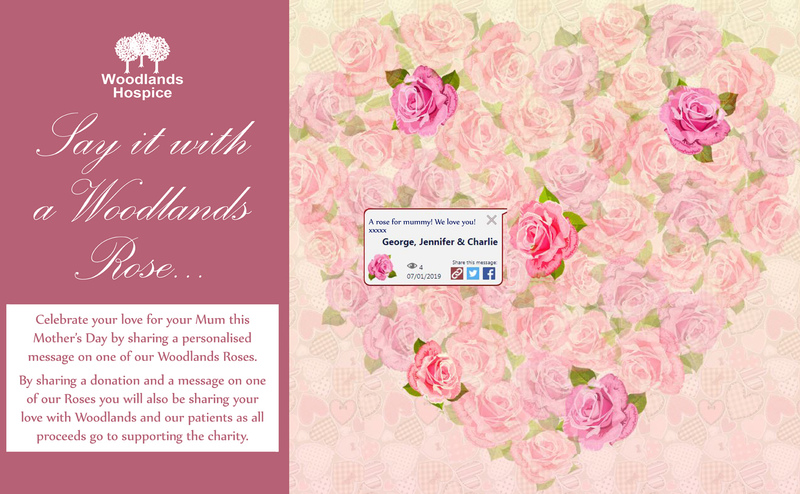 Simply select a Woodlands Rose from our online bouquet and write your special, personalised message for your Mum. We look forward to seeing our bouquet bloom with messages of love and thanks. By sharing your message of love with your Mum and making a donation to this campaign, you will be supporting Woodlands Hospice to continue providing excellent care and quality services to its patients and their families.